In fact, bespoke custom drivers (all 11 of them), 32-bit audio upscaling and Distortion Cancelling technology have all trickled down from the flagship HW-K950. Also on the spec sheet here are a trio of 4K-compatible HDMI ports, Bluetooth streaming and a bunch of music services supported via Samsung's slick Multiroom app. The HW-MS750 claims to go right down to 35Hz in bass extension. That would be low for full-sized speakers, and is downright subsonic from the confined cabinet space and small drivers of a soundbar. For day-to-day TV and music listening, the thinking goes, you simply don't need to add a subwoofer. For movie nights and extra depth, you might want one, though. Enter Samsung's SWA-W700. This optional extra is a 15kg thing of subtle beauty. It offers a matt-grey finish, interesting spiral brushed metalwork and a rear-facing 10in driver. It pairs wirelessly via a dongle that plugs into the USB port on the soundbar. While there are no spec details for its onboard amplification, it does boast the same Distortion Cancelling technology. Claimed output is down to 27Hz. The soundbar's 11-driver complement includes upfiring tweeters on the top surface. Sadly, this doesn't equate to Dolby Atmos playback; decoding is stoically Dolby and DTS in 5.1 guise. Those upfiring speakers simply aim to broaden and heighten the soundstage. Combined with super-width projection from the front drivers, the idea is to produce a sweet spot no matter where you are sitting in the room. Well, within reason. Such tricks in the past have come with bags of phasey distortion but Samsung's clever electronics hope to keep everything together nicely. The HW-MS750 packs in some other welcome features. If you have a current Samsung TV it will connect wirelessly, saving you using the HDMI passthrough or optical input. And then there's Smart sound, a feature we first enjoyed on the K950, which analyses the input signal in real time and adjusts output EQ on the fly. Again, there was a time when that sort of feature would result in an aural fiasco. Style-wise, the HW-MS750 is relatively subtle and innocuous. It's rather square-looking, the whole thing is a sea of grey textures, and the blue display is a frustratingly short four-characters wide. For any info, setting or input name longer than four characters it has to scroll. The display and top corner indicator lamps shut off after a few seconds. Clearly the cosmetic ambition here is to allow the soundbar to disappear into your room. The remote is Samsung's standard design and will, of course, control Samsung TVs and BD players. All of its main controls are replicated in the Multiroom app if you prefer to go with smart device operation. Optional extras include a bracket that allows the soundbar to hang below a TV without having to bolt it to the wall; a rear speaker pack to make it true 5.1; and the aforementioned SWA-W700 sub. The HW-MS750 plus SWA-W700 pair, as tested here, will set you back £1,100 (there's a £200 saving on individual pricing when bundled). That isn't far off Samsung's HW-K950 flagship, which comes with its own sub, wireless rear speakers and Dolby Atmos decoding for a 5.1.4 soundstage. Adding rear speakers alone to the HW-MS750 would set you back another £250 for Samsung's SWA-9000S rear speaker kit. So why not go for the K950 then? Well, the HW-MS750 is designed as a compact, high-quality soundbar solution for music and TV. It's solidly made, easy to use and at ‘just' 115cm wide, it won't look out of place if your TV is smaller than 55in. There's none of the visual calamity of rear speakers to muck up your minimalist décor. Moreover, the SWA-W700 would eat the K950's sub for breakfast and burp dinosaur footsteps from Jurassic Park afterwards. I've listened to enough Samsung soundbars this year to detect the California Lab's acoustic signature, which offers depth, clarity and projection into the room akin to listening to a good set of genuine front-end speakers. The HW-MS750 is absolutely no exception. Quite how Samsung's boffins manage to get such clarity and authoritative bass out of the soundbar alone is a mystery to me. Add in the sub and you get a full-scale presentation. One of the best pre-credits opening sequence of any movie can be found in Star Trek (2009). You get tension, combat, action, cataclysmic explosions and heart-rending drama condensed into ten minutes of visual and audio delight. Against the stunning 4K HDR picture of the UHD BD, this Samsung pair did not disappoint. The ship's ambience and space is supremely well presented. While those upfiring speakers may not be Atmos-enabled, they do a good job of expanding the sound into your room. Dialogue remains crisp and focused when the action is going off, and the bar's own LF extension keeps male voices true even if you are not using the sub. As the Federation ship collides with Nero's giant mining vessel, the interplay of explosions and silence is breath-taking. Whack up the wick and this pairing hangs together to impressive volumes. My only critique here is that you get very little control over the subwoofer, just a few dB gain or cut relative to the soundbar volume. In my fair-sized 35m2 room, and with my penchant for ‘aving it large with movies, I could have done with a bit more actual bass volume. No complaints about its tautness or impact. I just wanted more of it. On less explosive films and for day-to-day listening the balance between the 'bar and sub is much better gauged. Despicable Me 2 is close to our hearts here at HCC towers, both for the Dolby Vision 4K BD and because Gru reminds us of our editor Mark. The movie's sound is a festival of fun, too, with subtle effects from start to finish that this Samsung duo eked out and highlighted with precision and clarity, while retaining a naturalistic feel. Music is a real strength of the brand's new breed of soundbars and the MS750 is rich, solid and well detailed… if you feed it the right source. Uncompressed FLAC and ALAC files through the optical input were superb, yet Bluetooth sounded distinctly flat and lacklustre in comparison. Playing with the settings, you can't help but be impressed with the Smart mode. Depending on material, its effect can be anything from subtle to sublime but rarely did I not prefer the result. It seems to add further solidity and body to the overall presentation, creating an even richer listening experience. Leave it on. Samsung is on an audio roll at present, with investment in its new laboratory showing through all the latest-gen soundbars. The HW-MS750 may not be the best specified of the lineup, but can't be ignored. Bought on its own, without the subwoofer, it delivers a superior one-box sonic solution. Yet for HCC readers with deep pockets, the added investment in the SWA-W700 woofer is a worthy one, despite niggles about its integration. We say: This soundbar may lack Atmos but its sophistication and solid, spacious sound is addictive. 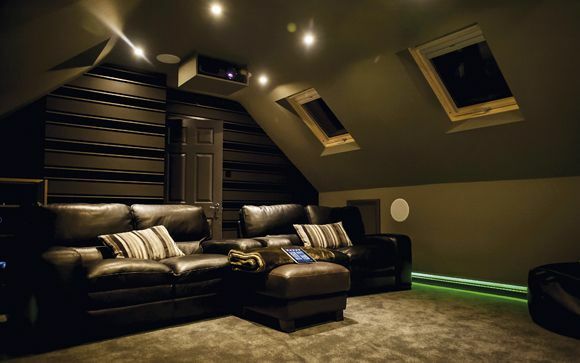 Add in the sub and you get a great movie experience without extra boxes and wires.